One universally accepted fact about aging is that hearing becomes more difficult with age. Even with modern hearing aid technology and major strides in research involving age-related hearing loss, millions of seniors suffer from hearing impairments. However, this doesn't mean that they should have to miss out on the conversation. There are ways to communicate with seniors suffering from hearing loss so as not to cause frustration, and to make communicating easier; here are 5 of our top tips for communicating with seniors with hearing loss. Maintaining eye contact is a solid communication tip no matter who you’re speaking with, but it takes on extra importance when communicating with seniors with hearing loss. When you maintain eye contact while talking, the person you are communicating with has a clear view of your mouth, allowing them to infer what you are saying when it might be hard for them to hear you. Facial expressions and overall animation are also major factors that contribute to communication, and can be used by seniors that are hard of hearing to help them understand you. The importance of enunciation goes hand-in-hand with the importance of maintaining direct eye contact. If you speak very clearly, and make sure that your words are spoken without trailing off or blending, it is much easier for people with hearing impairment to read your lips. The goal is to speak deliberately and slowly, enunciation will typically follow. The best way to explain voice volume when speaking to a senior that is hard of hearing is, “commanding, but not yelling.” Raise your voice to the point that it feels like you are speaking at the highest “inside voice” you can comfortably utilize. Maintaining a calm tone is imperative, it can become frustrating and hurtful when hearing impaired seniors feel like they are being yelled at, or that you are frustrated with them. It can be easy to forget how difficult conversations are to follow when you don’t personally have any hearing issues. Family gatherings are especially hard on seniors with hearing impairments for example, primarily due to the fact that they are extremely overwhelming and there are a lot of different noises. It becomes significantly more difficult to keep up with several voices sounding off at once when you have hearing issues. When speaking to a senior that is hard of hearing in a group environment, take turns speaking directly to them, and try to minimize background noise as much as possible. One of the most common habits of hearing impaired seniors is pretending that they understand and are following the conversation. It can be embarrassing for them to admit they are having trouble hearing, so they often pretend they can hear without any issues. This is most commonly reflected in the “nodding and smiling” phenomena. Periodically check in with them to make sure they are keeping up with the conversation, and reassure them that it is ok if they can’t keep up. While communicating with an individual that is hard of hearing can often come with its own set of frustrations, it doesn’t have to. Even utilizing two or three of the tips mentioned above should immediately improve the quality of communication you have with friends and loved ones that are hearing impaired. Just remember, as frustrating as it can sometimes be for you, it is infinitely more frustrating for them to struggle when communicating, so be patient and kind. And a reassuring smile never hurts! Seniors are embracing technology in droves. 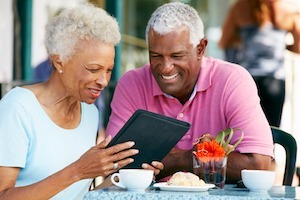 According to the Pew Research Center, 67% of seniors age 65 and older use the Internet and 42% own smartphones today. Apps for smartphones or iPads can make life easier and more interesting. But with tens of thousands of apps on the market and more coming out daily, picking the best ones that also specifically address the needs of seniors can be daunting. Here are the 21 best apps for seniors, whether they’re for entertainment, health or are just plain useful. This app gives you senior-specific news, shares events happening locally and tells you what discounts you qualify for with your AARP membership. If you hate reading restaurant menus by candlelight, you may find this magnifying glass app handy. Simply hold your phone over any text and the EyeReader will magnify it and light it up for you. Never lose your pricey iPhone or iPad with this app. If you leave your phone somewhere or it gets stolen, this app will find it. No more asking your family to call to ensure they’ve arrived home safely. This app uses GPS tracking to keep track of family members as they attend school, vacations or work. And they can keep track of you, too. You’ve heard of the buzz surrounding Lyft and Uber, but did you know these services are particularly useful for seniors? No more calling for a taxi and fumbling with cash or card. With just a couple clicks, you can have a car at your service to take you anywhere: the airport, doctor’s appointments, a party or the theatre. The payment’s already set up, so you don’t have to worry about paying or even tipping (although both Lyft and Uber accept tips now). Uber’s come under a bit of controversy lately, so I recommend Lyft. Find out which grocery stores, hotels, restaurants and theaters offer senior discounts in this app. iPads and smartphones can be hard to use because of the tiny buttons and text, and it can be impossible for the visually impaired. This app allows you to enlarge buttons and text on iPads and iPhones. Use Facetime or Skype to visually connect with your children, grandkids or friends in far places. It’s truly like having your favorite people in your living room – without the mess. You have to download Skype, but Facetime comes already applied to all Apple products. There are 100s of weather apps, but Yahoo! Weather is worth downloading because it has a beautiful design and it’s simple to use. It allows you to track the weather for your location up to five days out and it includes radar maps. Heart disease remains the leading cause of death in the United States, according to the Centers for Disease Control. This blood pressure app measures your blood pressure and heart rate. These measurements are contained in charts that you can show your doctor. You can also get the Android version as well. If you struggle with the high cost of prescription medications, this app will save you lots of money. It compares prices from more than 60,000 pharmacies to find you the best price for your prescription drugs. Identify pills by color and shape, find out the side effects of a medication and get reminders of when to take your pills with these handy apps that gets high ratings from users. Much like the Fitbit, this app tracks your daily walking, jogging or even bicycling. It’s always on (unless you turn it off). You know the panic buttons people wear around their necks? There’s an app for that and it’s free. Press the red panic button and a message goes out to a designated list of people that you need help STAT. It also includes the address where you are located. This app is like a one-stop shop for a fitter you, both inside and out. It’s highly rated and hugely successful and for good reason: it helps you eat better and meet your fitness goals, all in a very “Zen-like” way. Sit back and let some of the country’s top storytellers take you away. Castro is a no-fuss podcasting app that downloads and sorts the newest episodes of your favorite podcasts (like NPR’s This American Life or The Moth). The con? It’s only for iOS. For Android, I recommend Podcast Addict. No more carting books on trips to doctor’s waiting rooms. You can read books right on your iPad or even iPhone with the iBooks and the Kindle apps. These download your purchases directly to all your personal devices. Watch movies or TV shows on your iPad, phone or tablet with this app. You do pay for a subscription. If you love music, Pandora or its rival, Spotify is a must. Pandora allows you to create a radio station based on your favorite genre of music or favorite artists and songs. There’s simply no better way to discover new music. Like Spotify, Pandora now allows you to play your favorite individual albums or songs. Upgrade for a small fee to a no-commercials version. Your grandkids love Instagram. Your kids love Facebook. You just may love Tapestry. This social media app was specifically created to connect seniors to their families without worrying about privacy or, as the company says, “how everything works.” Share messages, photos and videos with your family. It’s ad and spam-free. Exercise your brain with this word puzzle app. The puzzles start out easy and get harder as you go. This is one of the most highly rated puzzle apps on the market. Whether it’s the bluesy tones of classic country music, the melodic harmonies of an old-fashioned R&B song, or the energizing instrumentals of a rock n’ roll band, music creates impressions in a human being’s soul. By pressing play on a favorite song, a lifetime of memories can come flooding back and be experienced all over again. And that is precisely the goal when it comes to music therapy for Alzheimer's treatment - to allow patients to relive past memories through song. The healing power of music has incredible potential for improving the quality of life for Alzheimer’s patients, and the first time you see a loved one with Alzheimer's singing along to a favorite song from their youth, the value of music therapy and the happiness that it brings becomes immediately clear. The first time that music is introduced as a form of therapy for Alzheimer's patients has been consistently described as a “night and day” difference. All of a sudden, a loved one that was bordering on completely non-responsive is smiling, swaying with the beat, and humming. Their entire disposition is changed instantly. Suddenly their mind is back in the jazz club where they met their spouse, at a high school football game for homecoming, or road tripping with a dear friend at the start of summer vacation. A simple song becomes associated with a special moment in time, tapping into a deep instinctual place in the mind that triggers overwhelming happiness associated with that memory. That is the power of music when introduced to the life of an Alzheimer’s patient, it can genuinely feel like magic. If you have any experience with Alzheimer’s, you know that happiness is incredible therapy. Not only for the person suffering from this terrible disease, but also the caretaker(s). For many, a single smile from their loved one is enough to keep them moving forward. The core of most treatment and care for Alzheimer’s patients is to stimulate the brain to keep it active and healthy. There are countless studies that credit maintaining an active brain as the best way to keep a high quality of life when living with a memory-related disease. There are a number of studies that show that maintaining a steady level of brain activity improves blood flow to the brain, and also increases the brain's ability to form important connections between different emotional centers. 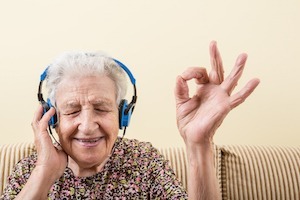 Doctors at Wake Forest Baptist Medical Center found that when individuals listened to their favorite songs from their youth, connections were immediately made between the brain areas responsible for memory and social emotion. They even found that music therapy can actively help to restore connections in the brain that were broken through illness or injury. What does this mean? That it might actually be possible that those immediate, happy emotional responses to musical therapy are also having long-term benefits, such as memory recovery, and increased social awareness. It is extremely low-cost or likely completely free - All you need is a good set of headphones or speakers, and a device to play music from (try using Spotify to search for your loved one's favorite songs). Individuals suffering from Alzheimer’s often have a feeling of being lost mentally, and have trouble pinning down exactly where they are without some sort of anchor to “bring them home.” Often, the patient's caregivers serve as this anchor, but music can serve this role as well. It isn’t uncommon for an anchor song to be able to bring Alzheimer’s patients out of states of complete trance. How can you establish music as an anchor for your loved one? Choose a particular song or genre of music that was special to your loved one from their youth. Connect this song/genre with a state of calm in your loved one by playing it to them often when they are relaxed. After this song becomes associated with a state of calm for them, playing it to them when they are having a "bad moment" can do wonders. Recent studies have also shown Alzheimer’s patients reacting in miraculous ways to being taken on a “journey through their life” with music. Early results show that this method actively increases overall happiness, gives patients a strong sense of control, and effectively stimulates the memory center in the brain. How can you create a "journey through life" with music? Finish off the playlist with songs from their golden years. While music therapy for Alzheimer's might not be a true cure, many caregivers and Alzheimer’s patients consider it to be like magic. Given the ease of implementing music therapy, and its success rate at increasing quality of life for people living with Alzheimer's, many professionals agree that music therapy should be used widely as a legitimate means of therapy and treatment for Alzheimer's and other dementias. The first time you see your loved one's reaction to music therapy, their happiness rolling across the room in waves, you immediately know that the magic of music isn’t just a cheap platitude, it is very real. If you would like to explore music therapy as an option for your loved one, or if you are looking for a in home care Tampa provider with experience caring for individuals with Alzheimer's, American In-Home Care can help. We refer qualified and compassionate care providers that are matched directly with your loved one's personality and needs. We can refer care providers that specialize in Alzheimer's and dementia care, and who have training and continuing education in this area to ensure they provide the highest quality of care to your loved one, and that you and your loved one are in the best hands. Halloween can be such a sweet time of year for people of all ages. Costumes and candy are two main components of this festive holiday, but for seniors too many sweets can be harmful to their oral health. Oral hygiene is extremely important as we age, especially given that dental health is often one of the first personal hygiene steps that gets neglected. Candy and other sweet treats around the holidays can cause seniors' oral health to do a downward spiral, especially if they are already neglecting to take care of this important hygiene step in the first place. Tooth sensitivity can be an increasing problem as one ages. Your gums naturally recede over time, exposing areas of the tooth that are not protected by enamel. These areas are particularly prone to pain due to cold or hot foods or beverages. If you experience sensitivity, try an anti-sensitivity toothpaste. If the problem persists, see your dentist, as the sensitivity may be an indication of a more serious condition, such as a cavity or a cracked or fractured tooth. Tooth or root decay. Even at 55-plus years, adults can still develop tooth or root decay if gum recession has occurred. It is important for older adults to effectively clean the gums, the teeth and exposed root surfaces to remove dental plaque and food debris. Brushing teeth at least twice a day and flossing daily is of utmost importance for seniors. However, even if you brush and floss regularly, you may face certain issues in your senior years when it comes to your oral health. Luckily, your dentist and physician can help you meet most of these challenges quite successfully. People often lose tastebuds as they age, which causes them to crave sweet tastes over other tastes. This is because research shows that the ability to taste sweet flavors - over bitter or salty flavors - appears to be preserved the longest. Some seniors also have a hard time tasting other more subtle flavors due to medications that can affect taste. So should seniors miss out on the sweet-fueled fun of Halloween to protect their oral health? Not necessarily. Chocolate no-bake bars that are made with peanut butter, coconut oil, and agave or honey as a sweetener. This chocolate banana bread is gluten-free and contains no refined sugars. Looking to channel the flavor of the season? This Greek yogurt pumpkin bread adds a great protein punch of pumpkin to a favorite recipe. Whole wheat pumpkin applesauce bread adds a healthier dimension to this seasonal treat. Cinnamon apple chips are an excellent treat that's appropriate for nearly any diet. Apple cider is a favorite treat of people from all generations, especially as the nights get cooler! Chocolate and sea salt covered almonds are great for seniors who don't have problems chewing. Keep in mind that they are hard, so they might not be good for seniors who have issues with their teeth. Dark chocolate coconut bites use honey or maple syrup instead of refined sugar for a healthier sweet option. These no-bake chocolate peanut butter cups are a healthier version of the Halloween favorite. There are so many tasty options for sweet treats; candy does not have to be one of them. In addition to not containing refined sugar, many homemade, healthy sweet contain health-boosting ingredients including, ginger, coconut, and dark chocolate that are all known to have health-boosting properties, as well as nuts and nut butters that contain additional protein. Be sure that you're considering your loved one's dietary requirements when you select a sweet treat. While there are some seniors who can still eat whatever they like within reason, others may have specific restrictions that prevent them from eating certain types of baked goods or sugary treats. That doesn't mean, however, that you can't find a sweet treat that fits their diet. Speak to your doctor about finding sweet alternatives if you are diabetic, or if you have any concerns about oral health or diet. American In-Home Care can also help by referring qualified and compassionate home and respite care Tampa providers that can assist with oral hygiene and other personal hygiene tasks, as well as diet monitoring and meal preparation. Contact us for a free in-home consultation to discuss care options. Stay healthy this holiday season, and Happy Halloween! For many, Fall is considered the best time of the year. The temperatures are fresh and crisp, the holidays are right around the corner, delicious seasonal food is on every store shelf, and it's a time for community and celebration, making it a wonderful time of year - no matter what stage of life you are in. While you might not be going door-to-door in a costume in your golden years, there are still many ideas for Fall fun for seniors to enjoy the lively, communal energy of the season. You could celebrate the changing of the leaves by going on a hike or a small road-trip, enjoy the unofficial season of apple cider, hot chocolate, and pumpkin-flavored foods at a Fall festival, tell your grandkids scary stories from your youth and reminisce about jumping at shadows and eating smore's by fire, enjoy festive foods with your close friends and family over a pot luck themed for the season, or participate in a local Fall bake sale to raise money for a great cause while watching people enjoy your hard work in the kitchen. Local Fall festivals are a great way for seniors to enjoy the season while also enjoying many other benefits - Fall Festivals help seniors maintain a sense of community involvement, while partaking in low impact exercise and plenty of important mental stimulation. Not to mention, they are just plain fun at any age. Most local festivals are always looking for additional help as volunteers or vendors as well. If you are particularly crafty or great in the kitchen, consider contributing your talent. Even if you don’t necessarily want to become involved as a vendor, there are usually many volunteer opportunities that could include senior members of the community telling “story hours,” sharing their stories of the community in times past with attendees. Today’s seniors grew up during what is arguably the golden-age of spoken-word stories in America. Plus, seniors have lived through many important events in history, making them a rich and accurate source for story-telling. Telling stories is not only a fun way to learn about the past from seniors, but it is also a very good way for seniors to provide mental stimulation for seniors by remembering and recollecting past events from their life, while interacting with others. A fun and seasonal way to prompt seniors to tell stories from their past is to plan a “scary story” night around Halloween. You could host the gathering at your own home, or at your aging loved one's house, and invite your family and any of your loved one's friends. Feel free to go all-out with a themed party - having Halloween decorations and themed foods, and set up a fake campfire for the group to sit around to share and listen to scary stories. This event is especially fun for seniors and kids alike! Pot lucks are a great seasonal activity for seniors because cooking for others can be incredibly therapeutic and often comes along with many other benefits. 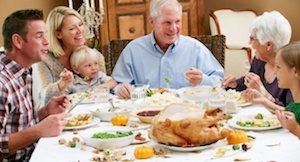 They are also an excuse for friends and family to get together and enjoy good food and good company. You could take it a step further this year and create a theme to your pot luck - a Fall themed pot luck could ask that everyone includes something pumpkin into the dish that they make, or that everyone makes the food Halloween decorated or themed. Another idea would be to have a heart healthy, or sugar-free foods theme to have the fun experience of a pot luck without the unwanted inches on the waistband. There are some great healthy recipes included at the bottom of this blog! Fall bake sales are an age old American tradition; dating all the way back to 1891. That’s 126 years of community bake sales! There is a reason the institution of the American bake sale has thrived for so long. They are a great way to encourage community, socialize, get active, and most importantly; eat tasty Fall themed confections. The best part about bake sales is that they work no matter your age. You can coordinate with your neighbors, or your local community groups to plan a bake sale, and before you know it you’ll have a line around the block ready to buy tasty Fall themed treats. These recipes are sure to be a hit at any age whether you’re serving a large group at a pot luck, or aiming to be the star of the bake sale. Bonus: Every one of the following recipes is heart healthy and either sugar-free or low sugar! They also are all limited to 3 easy-to-follow steps. Cold weather means warm drinks, and this spiced coffee recipe is a perfect, healthy way to have a delicious holiday drink. Step 1: Create the spiced syrup by heating a small saucepan over medium heat. Add ½ cup of sugar, and ½ cup of water. Add 1 ½ teaspoons of allspice, 1 ½ teaspoons of ground cinnamon (plus more to taste), and 1 ½ teaspoons of ground ginger. Simmer for about 5 minutes until the sugar is completely dissolved. Step 2: Add spiced syrup to coffee to taste. ¼ of a tablespoon is usually plenty to adequately flavor a single cup of coffee. Apple pie eggrolls are a perfect solution for those looking for the traditional taste of apple pie without all of the fuss and additional calories. They are also great for parties and pot lucks because they are made in individuals servings! Step 1: Heat 2 tablespoons of butter over medium heat until it begins to brown. Add 5 cups of diced and peeled Granny Smith apples, 3 tablespoons of sugar, ¾ teaspoon of cinnamon, nutmeg, and salt to taste. Cook until the apples are softened, add 1 tablespoon of flour and cook for one more minute. Remove from heat and stir in 2 teaspoons of lemon juice. Step 2: Place about ½ cup of the apple filling in the center of a single egg roll wrapper. Fold both sides of the wrapper over the filling, then fold the bottom corner and roll up as tightly as possible. Repeat with all of the remaining wrappers. Step 3: Combine 1 tablespoon of sugar and ½ teaspoon of cinnamon and place near oven. Heat oil until shimmering and add rolls, turn frequently until golden brown on all sides. Dredge the hot rolls in the cinnamon-sugar. Let the rolls sit for several minutes and serve. This dish is so good and rich that people won’t even believe that you made it healthy. Rather than using extremely high sodium canned soup, this recipe calls for making your own creamy sauce substitute; that not only tastes better, it’s much better for you. Step 1: Heat a large skillet over medium-high heat. Add 1 tablespoon oil to pan; swirl to coat. Add 1 cup diced onion and 1 cup diced bell pepper; sauté 5 minutes. Add 32-ounce bag of frozen potatoes; cover, reduce heat to medium, and cook 8 minutes or until potatoes begin to brown, stirring occasionally. Stir in salt and black pepper to taste. Step 2: Combine 1 ½ cups of low-fat milk and 2 tablespoons of flour, stirring with a whisk. Add milk mixture to pan; cook 3 minutes or until thick and bubbly, stirring frequently. Remove pan from heat. Stir in 4 ounces of low-fat yogurt and 1 cup of low-fat cheese. Spoon mixture into an 11 x 7-inch baking dish coated with cooking spray. Step 3: Place sugar free cornflakes in a medium bowl; drizzle with butter and remaining 1 1/2 tablespoons oil, and toss to coat. Sprinkle cornflakes over potato mixture. Bake at 350° for 35 minutes or until bubbly around the edges and topping is crisp. If you or your loved one needs help to remain at home, or could use extra assistance over the holidays, we can help. The in home care Tampa caregivers we refer can perform a variety of in-home care services including meal-preparation, help with errands and shopping, live-in care, and respite care. Contact us for a free in-home consultation to discuss care options. As fall is upon us, and the seasons begin to change, our bodies will start to change as well, acclimating to the new season and temperatures. These changes can be felt even more drastically among the elderly because the older we get, the harder it is for our bodies and immune systems to adapt to change, and the more susceptible we become to catching a cold, getting the flu, or many other illnesses. The best way to build up your immune system at any age is by sleeping and eating well. As we get older, we tend to eat less and have less variety in our diet, which can contribute to seasonal sickness and other ailments. Eating more fruits and vegetables that are rich in vitamins C and E, beta-carotene, and zinc is important to maintaining good health, as well as maintaining a low-sugar, low-fat diet that incorporates whole grains and lean proteins. Maintaining a balanced diet, along with getting 8 hours of sleep is the best way to keep your immune system healthy! Germs are everywhere, and throughout the day we touch hundreds of surfaces that are dirty and we do not even realize it. Viruses can spread easily from touching a dirty surface and then touching our eyes, noses, and/or mouths. People can also be contagious with a virus before they even know they have it, or before they show symptoms, so you can imagine how easy it is for germs and viruses spread around. Taking precautions against germs is especially important when it comes to the elderly because aging immune systems are more susceptible to disease. Consistently washing your hands throughout the day is the best way to beat germs, particularly before you eat, or when you are planning to be around other people. Children are the biggest carriers of germs - they are more likely to forget or not know to cover their mouths when they cough or sneeze, and to forget to wash their hands after using the restroom, especially if not accompanied by an adult. This is why adults who are around children are much more susceptible to getting sick, so if you have an elderly loved one that is going to be around children during the holidays, make sure to take extra precautions against germs. Bottom line: wash your hands as much as you can throughout the day, and be sure elderly loved ones wash their hands often. Keeping your hands clean is the safest way to avoid getting a virus. The biggest threat to a seniors during the fall and winter months is the flu, and the best way to prevent this threat and protect yourself and others is by getting a flu shot. 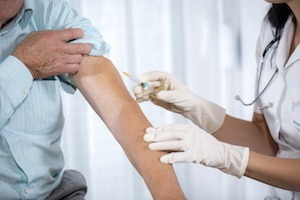 A flu shot is recommended for anyone over the age of 6 months, but they are particularly important for people age 60 or older due to weaker immune systems. It is one of the most critical methods in fighting the flu today. The Center for Disease Control or CDC recommends getting a flu shot no later than October each year. The vaccine is adjusted and varies year by year based on which strains of the flu are the most prevalent each year. Flu shots can be administered at most Walgreens and CVS, and also by your Primary Care Physician. Be sure to talk to your doctor about the flu shot and if it is recommended for you. In short, taking some simple precautions as the seasons change is crucial preventing colds in the elderly. As the weather transforms, so does the body’s ability to fight off the germs that can severely affect the body, especially in the elderly. Keeping the immune system strong, continuing to keep hands clean and getting a flu shot are just a few ways to preserve overall health and well-being. Contact us for a free in-home consultation to discuss care options. We are pleased to announce some upcoming October events! Our Client Care Liaison and Certified Senior Advisor, Kristi O'Neal, is leading two important and informational discussions and workshops this month in Florida. Be sure to check them out if you are in the area, and be sure to RSVP! and Making the Invisible Visible: ER Nursing Care of the Crohn's and Ulcerative Colitis Patient Population. Our American In-Home Care employee, Kristi O'Neal, a Client Care Liaison and a Certified Senior Advisor, will be giving the first talk on Geriatric ED Visits. Dinner is included with the event. You must RVSP by 10:00 am on October 11th. RSVP here. So far in 2017, the United States has experienced major hurricanes, dozens of wildfires, widespread droughts, and multiple earthquakes. The importance of being well prepared has never been greater, especially for senior residents, who often require certain considerations such as medication or oxygen. Seniors are especially vulnerable during natural disasters, that's why emergency preparedness for older adults increases their safety during a natural disaster. Seniors who need care are especially vulnerable during an emergency because they can’t easily get around and often have special healthcare needs. Creating an emergency kit and plan takes some effort, but it can mean the difference between developing a serious health issue or surviving the disaster unharmed. We share 4 important steps you can use to help your older adult prepare for the next natural disaster. It’s critical that your older adult has the food, water, medicine, and supplies they’ll need to survive an extended power or water outage. One gallon of clean drinking water per person, per day. Dehydration is one of the most dangerous aspects of the post-disaster recovery process. At least one full week of food that requires no refrigeration and won’t go bad due to exposure. Batteries and flashlights to help alleviate dangerous low-light conditions at night without power. A well-stocked first aid kit. Sanitary wipes in case you have no access to clean water for bathing. A full gas tank, disasters commonly take out power for gas stations as well, resulting in a fuel storage that can last days or even weeks. Clean and dry clothing to last for at least a full week. All necessary medication with a minimum of one full weeks’ worth of extra medication on hand. A simple generator if your medication requires refrigeration to ensure that it doesn’t go bad while the power is out. If a generator isn’t an option you should speak with neighbors or your pharmacist for options. Prepare medical supplies that are specific to any conditions you may suffer from. It is recommended that you place all of these in a single medical kit. Write down any emergency contact numbers, you likely won’t be able to charge your cell phone so you may need them on hand. Withdraw enough cash to pay for several meals, groceries, or gas. Chances are that any store that reopens won’t have immediate use of their card machines. *Important* If you use oxygen, ensure that the power company is aware before any disaster hits if possible, they will strive to restore your power quickly as an emergency priority. Ensure that any pets have excess food and clean water to last at least a week. Freeze water bottles and leave them in your freezer to help food stand longer. Fill your washing machine with ice to help perishables last up to a week without power. Bonus, the water will drain directly out of your washing machine, so no cleanup. Catheters, feeding tube, or ostomy supplies, etc. You might not always be nearby to help your older adult when disaster strikes. That’s why it’s essential to create a support network of trusted neighbors, relatives, and friends who could step in during an emergency. Familiarize them with your older adult’s needs. Make sure everyone knows which medications, supplies, and medical devices are important, where they’re kept, and how to use them. Also, give them a copy of the emergency plan and access to your senior’s residence. Depending on the type of disaster, it could be safer to either evacuate or shelter in place. Nature is unpredictable, so prepare one plan for sheltering in place and another for evacuating. Written plans are best for handing out and reviewing with everyone in your senior’s support network. That way everyone will be clear on what to do and where to go. And if you’re separated, you’ll know where to find your older adult. If they need routine treatments in a clinic or hospital (like dialysis), talk to the service provider about what to do and where to go for back-up care during an emergency. Be sure to include that information in the emergency plan. Seniors who depend on Social Security or other federal benefits can run into trouble if they rely on mailed payments. During emergencies or evacuations, mail services can be interrupted for days or weeks. Even worse, checks could get stolen. To prevent financial problems and fraud, make sure your older adult is receiving their benefits electronically. Important: Seniors who are still getting a paper check for Social Security or other federal benefit payments are out of compliance with the law. Choose to get payments either by direct deposit to a bank or credit union account or to a Direct Express® prepaid debit card account. If your older adult has a bank account, direct deposit is the best option. Sign up for direct deposit to a bank account by contacting the U.S. Treasury Electronic Payment Solution Center at (800) 333-1795, signing up for direct deposit online (select the direct deposit option), or signing up through your local bank or credit union. Sign up for the Direct Express® card by contacting the U.S. Treasury Electronic Payment Solution Center at (800) 333-1795. If you or your loved one could use help preparing a emergency response kit, or feeling safe and secure in your home, we can help! American In-Home Care always refers qualified, screened, and insured care providers that are compassionate and ready to help with services like transportation, health data monitoring, meal preparation, and support with activities of daily living. Contact us at 1-844-505-0004 to schedule your free in-home consultation to discuss which care options are right for you and your family. September 9, 2015 – American In-Home Care, LLC (“AIHC”) has completed the acquisition of Advocate Home Care Services (“Advocate”), of Lauderhill, FL. This represents the fourth acquisition by AIHC since its inception in September 2013. With the addition of Advocate, American In-Home Care, a Silverhawk Capital Partners (“Silverhawk”) portfolio company, is now one of the largest independent in-home care providers in Florida serving over 90% of those 65 and older in the state. Advocate’s service areas are both complimentary and expansionary for AIHC, with the Fort Lauderdale, Miami, Lake Worth, and Naples offices adding to its market coverage in South and Southwest Florida. The Vero Beach, Tampa, and St. Petersburg offices serve new markets for the company. Like AIHC, Advocate provides caregiver referral and administrative support services for clients that prefer to continue living in the comfort and safety of their own home. The company helps clients accomplish this goal by referring comprehensively screened, credentialed, and insured independent caregivers who provide companion, homemaker and personal care services. AIHC is a Silverhawk Capital Partners portfolio company. AIHC was formed in September 2013 to address the independent living and personal care services industry, which is growing rapidly as a result of an increase in the aging population and their desire to age in place. The company provides referral services to older adults and others needing assistance with the activities of daily living, through its registry of licensed, screened, and empathetic caregivers. AIHC helps its clients reach their goal of remaining in their homes while allowing them personal control, selection and authority over this decision. AIHC and its clients recognize the benefits of this consumer directed approach. The company’s internal processes ensure that its registered caregivers are credentialed, verified and rigorously screened. This process includes a national background check, a review of current licensing requirements, and inspection of their liability insurance, to provide the company’s clients with control, choice and peace of mind when choosing their independent caregiver. Silverhawk Captial Partners is an independent investment firm established in 2005 to invest in lower middle market transactions within the Growth Industrial, Energy/Natural Resources and Business Service sectors. Silverhawk typically invests between $10 million and $50 million of equity capital in growth oriented businesses with revenues ranging from $25 million to $250 million. Silverhawk has offices in Greenwich, CT, Charlotte, NC and Overland Park, KS. Reach Silverhawk at info@silverhawkcp.com or call (203) 861-2905.